As a follow up to the Chicken Festival post, here’s another random observation that’s bugged me. 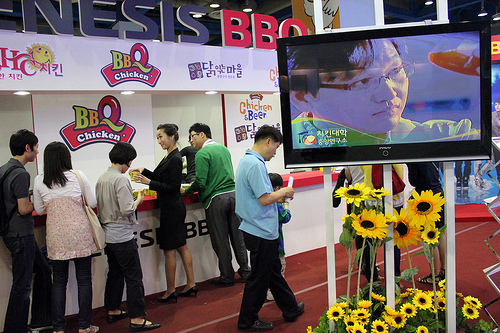 A corporate video in English for BBQ was playing at the booth. I’ve noticed this about Korean food ads. Some like to show pictures of laboratories and factories with men in white jumpsuits like they’re in a nuclear power plant, pushing lit buttons and swirling colored chemicals. Is this considered appealing and appetizing? In the land where irony goes to die, it’s funny that the popular thing for the past, maybe ten years, has been to eat healthy with all-natural whole foods. Then we see how BBQ has its Chicken University, where lab technicians–not chefs–come up with the recipes for their chicken, where they proudly state that only 1-percent of laboratory recipes makes it onto the menu.